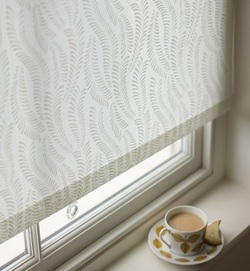 Sheer blinds are fast becoming the stylish alternative to traditional net curtains. They are modern, sleek and simple and offer the privacy benefits of a blind with the softening view of a sheer. Elegant and practical - a sheer Roman Blind is a delightful way to provide privacy with style. ​We have a select range of luxury voile fabrics suitable for Roman blinds including plains, spots and stripes as well as modern florals and geometric patterns. We can design sheer Roman blinds with traditional folds that hang flat when the blind is lowered or with cascading folds that remain in place even when the blind is down. A lovely palette of soft shades is now available in addition to the usual white and ivory options. They can be finished with coordinating blind pulls and braids to customise your blind and add that finishing touch. 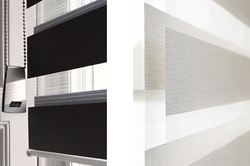 If you like the look of modern stripes Sheer Privacy blinds are for you. They provide great light and privacy control, as well as being ideal fabric solutions for kitchens and bathrooms. This amazing contemporary variation on a roller blind has two sliding layers of fabric with alternating solid & sheer horizontal stripes. As the two layers pass each other the blind goes from solid to sheer. It’s an amazingly simple and effective method for choosing just the right amount of incoming light and privacy.